Why are the methods and tools used to collect oil samples so important to an effective oil analysis program? It’s simple. Sampling practices have a huge impact on test results because everything that goes into the sample bottle ultimately affects what gets reported. Many organizations have come to understand the vital role lubrication plays in their overall plant operations and now set targets for extreme oil cleanliness levels. If the bottle you use to collect an oil sample contains even trace amounts of dirt or becomes contaminated from careless sampling procedures, your results will not reflect your oil filtration equipment’s actual condition. Initially, collecting an oil sample appears simple. But getting accurate oil sampling results requires knowledge of specific procedures based on the component analyzed, lubricant testing frequency, and tools used. The component configuration dictates which sampling methods and access points are best for collecting the sample. Because Simplo Jars are ultra-clean and vacuum-filled, the potential for environmental contamination during sampling is taken out of the equation. The technological advancements in the Simplo Jar not only eliminate the potential ingression of contaminants from the environment, but they also reduce the number of tools needed to collect a sample. LubriSource technicians can collect your oil samples with complete confidence that no environmental cross-contamination will occur because the Simplo Jar bottle cap is never opened. Each lubricant sampling bottle includes a safety cap that protects the nozzle and valve during shipping and storage while also preventing leakage. Each bottle is individually shrink wrapped to extend its shelf-life while protecting the airless vacuum inside. This packaging also prevents the bottle from exposure to potential contaminants during storage. turn the nozzle 90° to engage the vacuum (Figure 2 below). making the process essentially spill proof. The Simplo Jar can be used with various types of fluids including oils, coolants, diesel, biodiesel, and kerosene. Fewer tools are required to pull a sample. There’s less risk of contamination from sources such as dirty vacuum pumps or tubing. Each order includes a tube for each bottle. Reduces risk of cross-contamination from the operating environment. The sampling bottle requires minimal effort; just turn the valve and the vacuum does the work. Works with any viscosity; thicker lubricants just take a little longer. Each bottle has the same amount of vacuum and the same sampling properties. Less time is needed to collect the sample than with other methods. The device is not recommended for gasoline samples due to the high aromatic hydrocarbons. However, sampling fluids that have some gasoline contamination are still applicable. 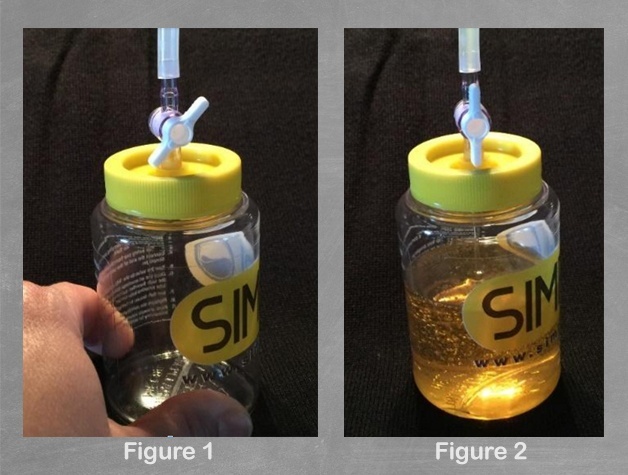 The Simplo Jar provides a best practice method for collecting samples that is a practical and efficient alternative to existing methods that use vacuum pumps and syringes. To extract using these traditional methods, fluid is often exposed to atmospheric pressure, typically via a fill port or dipstick port. The Simplo Jar is not designed for very high-pressure sampling ports like hydraulic systems. The device can still be used in these situations; however, the pressure in the system will fill the bottle. An important goal of any effective oil sampling program is to collect the most accurate information possible from the component while eliminating the potential for cross-contamination. Laboratory results matter. It’s important to ensure that what’s inside the bottle is an accurate reflection of the component tested. Contact the lubrication experts at LubriSource to bring the benefits of this revolutionary new method for sample collection to your facility. Using Simplo will give you greater confidence in your laboratory results. And with LubriSource experts at your side, you’ll gain the knowledge you need to build a more effective proactive maintenance program.